These highlights do not include all the information needed to use HYSINGLA™ ER safely and effectively. See full prescribing information for HYSINGLA ER. Daily doses of HYSINGLA ER greater than or equal to 80 mg are only for use in patients in whom tolerance to an opioid of comparable potency has been established. HYSINGLA ER is indicated for the management of pain severe enough to require daily, around-the-clock, long-term opioid treatment and for which alternative treatment options are inadequate. Because of the risks of addiction, abuse, and misuse with opioids, even at recommended doses, and because of the greater risks of overdose and death with extended-release opioid formulations [see Warnings and Precautions (5.1)], reserve HYSINGLA ER for use in patients for whom alternative treatment options (e.g., non-opioid analgesics or immediate-release opioids) are ineffective, not tolerated, or would be otherwise inadequate to provide sufficient management of pain. Daily doses of HYSINGLA ER greater than or equal to 80 mg are only for use in patients in whom tolerance to an opioid of comparable potency has been established. Patients who are opioid tolerant are those receiving, for one week or longer, at least 60 mg oral morphine per day, 25 mcg transdermal fentanyl per hour, 30 mg oral oxycodone per day, 8 mg oral hydromorphone per day, 25 mg oral oxymorphone per day, 60 mg oral hydrocodone per day, or an equianalgesic dose of another opioid. Monitor patients closely for respiratory depression, especially within the first 24-72 hours of initiating therapy and following dosage increases with HYSINGLA ER and adjust the dosage accordingly [see Warnings and Precautions (5.3)]. Instruct patients to swallow HYSINGLA ER tablets whole, one tablet at a time, with enough water to ensure complete swallowing immediately after placing in the mouth [see Patient Counseling Information (17)]. Instruct patients not to pre-soak, lick, or otherwise wet the tablet prior to placing in the mouth [see Warnings and Precautions (5.12)]. Crushing, chewing, or dissolving HYSINGLA ER tablets will result in uncontrolled delivery of hydrocodone and can lead to overdose or death [see Warnings and Precautions (5.1)]. HYSINGLA ER is administered orally once daily (every 24 hours). Multiple tablets of lower dose strengths that provide the desired total daily dose can be taken as a once daily dose. Initiate therapy with HYSINGLA ER 20 mg orally every 24 hours. The starting dose for patients who are not opioid tolerant is HYSINGLA ER 20 mg orally every 24 hours. Patients receiving other oral hydrocodone-containing formulations may be converted to HYSINGLA ER by administering the patient's total daily oral hydrocodone dose as HYSINGLA ER once daily. Discontinue all other around-the-clock opioid drugs when HYSINGLA ER therapy is initiated. There is inter-patient variability in the relative potency of opioid drugs and formulations. Therefore, a conservative approach is advised when determining the total daily dosage of HYSINGLA ER. It is safer to underestimate a patient’s 24-hour oral hydrocodone dosage and provide rescue medication (e.g., immediate-release opioid) than to overestimate the 24-hour oral hydrocodone dosage and manage an adverse reaction due to an overdose. 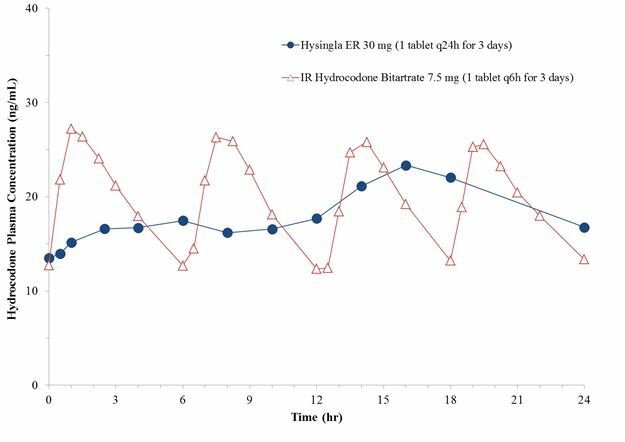 In a HYSINGLA ER clinical trial with an open-label titration period, patients were converted from their prior opioid to HYSINGLA ER using Table 1 as a guide for the initial HYSINGLA ER dose. To obtain the initial HYSINGLA ER dose, first use Table 1 to convert the prior oral opioids to a total hydrocodone daily dose and then reduce the calculated daily hydrocodone dose by 25% to account for interpatient variability in relative potency of different opioids. Consider the following when using the information found in Table 1. The conversion factors in this table are only for the conversion from one of the listed oral opioid analgesics to HYSINGLA ER. For patients on a single opioid, sum the current total daily dose of the opioid and then multiply the total daily dose by the approximate oral conversion factor to calculate the approximate oral hydrocodone daily dose. For patients on a regimen of more than one opioid, calculate the approximate oral hydrocodone dose for each opioid and sum the totals to obtain the approximate oral hydrocodone daily dose. Always round the dose down, if necessary, to the nearest HYSINGLA ER tablet strength available and initiate therapy with that dose. If the converted HYSINGLA ER dose using Table 1 is less than 20 mg, initiate therapy with HYSINGLA ER 20 mg.
For example, a total daily dose of oxycodone 50 mg would be converted to hydrocodone 50 mg based on the table above, and then multiplied by 0.75 (ie, take a 25 % reduction) resulting in a dose of 37.5 mg hydrocodone. Round this down to the nearest dose strength available, HYSINGLA ER 30 mg, to initiate therapy. Close observation and frequent titration are warranted until pain management is stable on the new opioid. Monitor patients for signs and symptoms of opioid withdrawal or for signs of over-sedation/toxicity after converting patients to HYSINGLA ER. Eighteen hours following the removal of the transdermal fentanyl patch, HYSINGLA ER treatment can be initiated. For each 25 mcg/hr fentanyl transdermal patch, a dose of HYSINGLA ER 20 mg every 24 hours represents a conservative initial dose. Follow the patient closely during conversion from transdermal fentanyl to HYSINGLA ER, as there is limited experience with this conversion. All patients receiving transdermal buprenorphine (≤ 20 mcg/hr) should initiate therapy with HYSINGLA ER 20 mg every 24 hours. Follow the patient closely during conversion from transdermal buprenorphine to HYSINGLA ER, as there is limited experience with this conversion. Individually titrate HYSINGLA ER to a dose that provides adequate analgesia and minimizes adverse reactions. Continually reevaluate patients receiving HYSINGLA ER to assess the maintenance of pain control and the relative incidence of adverse reactions, as well as monitoring for the development of addiction, abuse, or misuse [see Warnings and Precautions (5.1). Frequent communication is important among the prescriber, other members of the healthcare team, the patient, and the caregiver/family during periods of changing analgesic requirements, including initial titration. During chronic therapy, periodically reassess the continued need for the use of opioid analgesics. Patients who experience breakthrough pain may require a dosage adjustment of HYSINGLA ER, or may need rescue medication with an appropriate dose of an immediate-release analgesic. If the level of pain increases after dose stabilization, attempt to identify the source of increased pain before increasing the HYSINGLA ER dosage. Adjust the dose of HYSINGLA ER in increments of 10 mg to 20 mg every 3 to 5 days as needed to achieve adequate analgesia. Patients with severe hepatic impairment may have higher plasma concentrations of hydrocodone than those with normal function. Initiate therapy with one half the initial dose of HYSINGLA ER in these patients and monitor closely for respiratory depression, sedation, and hypotension [see Clinical Pharmacology (12.3)]. Patients with moderate to severe renal impairment, and end-stage renal disease may have higher plasma concentrations than those with normal function. Initiate therapy with one half the initial dose of HYSINGLA ER in these patients and monitor closely for respiratory depression, sedation, and hypotension [see Clinical Pharmacology (12.3)]. Do not abruptly discontinue HYSINGLA ER. When the patient no longer requires therapy with HYSINGLA ER, taper the dose gradually by 25% to 50% every 2 to 4 days, while monitoring carefully for signs and symptoms of withdrawal. If the patients develop these signs or symptoms, raise the dose to the previous level and taper more slowly, either by increasing the interval between decreases, decreasing the amount of change in dose, or both. The dose may be reduced every 2 to 4 days. The next dose should be at least 50% of the prior dose. After reaching HYSINGLA ER 20 mg dose for 2 to 4 days, HYSINGLA ER can be discontinued. Hypersensitivity to hydrocodone or any component of HYSINGLA ER. HYSINGLA ER contains hydrocodone, a Schedule II controlled substance. As an opioid, HYSINGLA ER exposes users to the risks of addiction, abuse, and misuse. Because extended-release products such as HYSINGLA ER deliver the opioid over an extended period of time, there is a greater risk for overdose and death due to the larger amount of hydrocodone present [see Drug Abuse and Dependence (9.1)]. Assess each patient’s risk for opioid addiction, abuse, or misuse prior to prescribing HYSINGLA ER, and monitor all patients receiving HYSINGLA ER for the development of these behaviors and conditions. Risks are increased in patients with a personal or family history of substance abuse (including drug or alcohol addiction or abuse) or mental illness (e.g., major depression). The potential for these risks should not, however, prevent the prescribing of HYSINGLA ER for the proper management of pain in any given patient. Patients at increased risk may be prescribed opioids such as HYSINGLA ER, but use in such patients necessitates intensive counseling about the risks and proper use of HYSINGLA ER along with intensive monitoring for signs of addiction, abuse, and misuse. Abuse or misuse of HYSINGLA ER by crushing, chewing, snorting, or injecting the dissolved product will result in the uncontrolled delivery of the hydrocodone and can result in overdose and death [see Drug Abuse and Dependence (9.1), and Overdosage (10)]. Opioids are sought by drug abusers and people with addiction disorders and are subject to criminal diversion. Consider these risks when prescribing or dispensing HYSINGLA ER. Strategies to reduce these risks include prescribing the drug in the smallest appropriate quantity and advising the patient on the proper disposal of unused drug [see Patient Counseling Information (17)]. Contact local state professional licensing board or state controlled substances authority for information on how to prevent and detect abuse or diversion of this product. While serious, life-threatening, or fatal respiratory depression can occur at any time during the use of HYSINGLA ER, the risk is greatest during the initiation of therapy or following a dosage increase. Monitor patients closely for respiratory depression especially within the first 24-72 hours of initiating therapy with and following dosage increases of HYSINGLA ER. To reduce the risk of respiratory depression, proper dosing and titration of HYSINGLA ER are essential [see Dosage and Administration (2.1, 2.2)]. Overestimating the HYSINGLA ER dosage when converting patients from another opioid product can result in fatal overdose with the first dose. Prolonged use of HYSINGLA ER during pregnancy can result in withdrawal in the neonate. Neonatal opioid withdrawal syndrome, unlike opioid withdrawal syndrome in adults, may be life-threatening if not recognized and treated, and requires management according to protocols developed by neonatology experts. Observe newborns for signs of neonatal opioid withdrawal syndrome and manage accordingly. Advise pregnant women using opioids for a prolonged period of the risk of neonatal opioid withdrawal syndrome and ensure that appropriate treatment will be available [see Use in Specific Populations (8.1), Patient Counseling Information (17). Concomitant use of HYSINGLA ER with a CYP3A4 inhibitor, such as macrolide antibiotics (e.g., erythromycin), azole-antifungal agents (e.g., ketoconazole), and protease inhibitors (e.g., ritonavir), may increase plasma concentrations of hydrocodone and prolong opioid adverse reactions, which may cause potentially fatal respiratory depression [see Warnings and Precautions (5.3)], particularly when an inhibitor is added after a stable dose of HYSINGLA ER is achieved. Similarly, discontinuation of a CYP3A4 inducer, such as rifampin, carbamazepine, and phenytoin, in HYSINGLA ER treated patients may increase hydrocodone plasma concentrations and prolong opioid adverse reactions. When using HYSINGLA ER with CYP3A4 inhibitors or discontinuing CYP3A4 inducers in HYSINGLA ER treated patients, monitor patients closely at frequent intervals and consider dosage reduction of HYSINGLA ER until stable drug effects are achieved [see Drug Interactions (7)]. Concomitant use of HYSINGLA ER with CYP3A4 inducers or discontinuation of an CYP3A4 inhibitor could decrease hydrocodone plasma concentrations, decrease opioid efficacy or, possibly, lead to a withdrawal syndrome in a patient who had developed physical dependence to hydrocodone. When using HYSINGLA ER with CYP3A4 inducers or discontinuing CYP3A4 inhibitors, monitor patients closely at frequent intervals and consider increasing the opioid dosage if needed to maintain adequate analgesia or if symptoms of opioid withdrawal occur [see Drug Interactions (7)]. Profound sedation, respiratory depression, coma, and death may result from the concomitant use of HYSINGLA ER with benzodiazepines or other CNS depressants (e.g., non-benzodiazepine sedatives/hypnotics, anxiolytics, tranquilizers, muscle relaxants, general anesthetics, antipsychotics, other opioids, alcohol). Because of these risks, reserve concomitant prescribing of these drugs for use in patients for whom alternative treatment options are inadequate. Advise both patients and caregivers about the risks of respiratory depression and sedation when HYSINGLA ER is used with benzodiazepines or other CNS depressants (including alcohol and illicit drugs). Advise patients not to drive or operate heavy machinery until the effects of concomitant use of the benzodiazepine or other CNS depressant have been determined. Screen patients for risk of substance use disorders, including opioid abuse and misuse, and warn them of the risk for overdose and death associated with the use of additional CNS depressants including alcohol and illicit drugs [see Drug Interactions (7), Patient Counseling Information (17)]. The use of HYSINGLA ER in patients with acute or severe bronchial asthma in an unmonitored setting or in the absence of resuscitative equipment is contraindicated. Patients with Chronic Pulmonary Disease: HYSINGLA ER-treated patients with significant chronic obstructive pulmonary disease or cor pulmonale, and those with a substantially decreased respiratory reserve, hypoxia, hypercapnia, or pre-existing respiratory depression are at increased risk of decreased respiratory drive including apnea, even at recommended dosages of HYSINGLA ER [see Warnings and Precautions (5.3)]. Monitor such patients closely, particularly when initiating and titrating HYSINGLA ER and when HYSINGLA ER is given concomitantly with other drugs that depress respiration [see Warnings and Precautions (5.3, 5.6)]. Alternatively, consider the use of non-opioid analgesics in these patients. HYSINGLA ER may cause severe hypotension including orthostatic hypotension and syncope in ambulatory patients. There is an increased risk in patients whose ability to maintain blood pressure has already been compromised by a reduced blood volume, or after concurrent administration of certain CNS depressant drugs (e.g., phenothiazines or general anesthetics) [see Drug Interactions (7)]. Monitor these patients for signs of hypotension after initiating or titrating the dosage of HYSINGLA ER. In patients with circulatory shock, HYSINGLA ER may cause vasodilation that can further reduce cardiac output and blood pressure. Avoid the use of HYSINGLA ER in patients with circulatory shock. QTc prolongation has been observed with HYSINGLA ER following daily doses of 160 mg [see Clinical Pharmacology (12.2)]. This observation should be considered in making clinical decisions regarding patient monitoring when prescribing HYSINGLA ER in patients with congestive heart failure, bradyarrhythmias, electrolyte abnormalities, or who are taking medications that are known to prolong the QTc interval. In patients who may be susceptible to the intracranial effects of CO2 retention (e.g., those with evidence of increased intracranial pressure or brain tumors), HYSINGLA ER may reduce respiratory drive, and the resultant CO2 retention can further increase intracranial pressure. Monitor such patients for signs of sedation and respiratory depression, particularly when initiating therapy with HYSINGLA ER. Opioids may also obscure the clinical course in a patient with a head injury. Avoid the use of HYSINGLA ER in patients with impaired consciousness or coma. In the clinical studies with specific instructions to take HYSINGLA ER with adequate water to swallow the tablet, 11 out of 2476 subjects reported difficulty swallowing HYSINGLA ER. These reports included esophageal obstruction, dysphagia, and choking, one of which had required medical intervention to remove the tablet [see Adverse Reactions (6)]. Instruct patients not to pre-soak, lick, or otherwise wet HYSINGLA ER tablets prior to placing in the mouth, and to take one tablet at a time with enough water to ensure complete swallowing immediately after placing in the mouth [see Patient Counseling Information (17)]. Pediatric patients may be at increased risk of esophageal obstruction, dysphagia, and choking because of a smaller gastrointestinal lumen if they ingest HYSINGLA ER [see Use in Specific Populations (8.4)]. HYSINGLA ER is contraindicated in patients with known or suspected gastrointestinal obstruction, including paralytic ileus. The hydrocodone in HYSINGLA ER may cause spasm of the sphincter of Oddi. Opioids may cause increases in serum amylase. Monitor patients with biliary tract disease, including acute pancreatitis, for worsening symptoms. Avoid the use of mixed agonist/antagonist analgesics (e.g., pentazocine, nalbuphine, and butorphanol) or partial agonist (e.g., buprenorphine) analgesics in patients who are receiving a full opioid agonist analgesic, including HYSINGLA ER. In these patients, mixed agonist/antagonist and partial agonist analgesics may reduce the analgesic effect and/or may precipitate withdrawal symptoms [see Drug Interactions (7)]. When discontinuing HYSINGLA ER, gradually taper the dosage [see Dosage and Administration (2.6)]. Do not abruptly discontinue HYSINGLA ER [see Drug Abuse and Dependence (9.3)]. HYSINGLA ER may impair the mental and physical abilities needed to perform potentially hazardous activities such as driving a car or operating machinery. Peak blood levels of hydrocodone may occur 14 – 16 hours (range 6 – 30 hours) after initial dosing of HYSINGLA ER tablet administration. Blood levels of hydrocodone, in some patients, may be high at the end of 24 hours after repeated-dose administration. Warn patients not to drive or operate dangerous machinery unless they are tolerant to the effects of HYSINGLA ER and know how they will react to the medication [see Clinical Pharmacology (12.3), Patient Counseling Information (17)]. A total of 1,827 patients were treated with HYSINGLA ER in controlled and open-label chronic pain clinical trials. Five hundred patients were treated for 6 months and 364 patients were treated for 12 months. The clinical trial population consisted of opioid-naïve and opioid-experienced patients with persistent moderate to severe chronic pain. The adverse reactions seen in controlled and open-label chronic pain studies are presented below in the following manner: most common (≥5%), common (≥1% to <5%), and less common (<1%). The most common adverse reactions (≥5%) reported by patients treated with HYSINGLA ER in the chronic pain clinical trials were constipation, nausea, vomiting, fatigue, upper respiratory tract infection, dizziness, headache, somnolence. Other less common adverse reactions that were seen in <1% of the patients in the HYSINGLA ER chronic pain clinical trials include the following in alphabetical order: abdominal discomfort, abdominal distention, agitation, asthenia, choking, confusional state, depressed mood, drug hypersensitivity, drug withdrawal syndrome, dysphagia, dyspnea, esophageal obstruction, flushing, hypogonadism, hypotension, hypoxia, irritability, libido decreased, malaise, mental impairment, mood altered, muscle twitching, edema, orthostatic hypotension, palpitations, presyncope, retching, syncope, thinking abnormal, thirst, tremor, and urinary retention. Anaphylaxis: Anaphylaxis has been reported with ingredients contained in HYSINGLA ER. Table 3 includes clinically significant drug interactions with HYSINGLA ER. Clinical Impact: The concomitant use of HYSINGLA ER and CYP3A4 inhibitors can increase the plasma concentration of hydrocodone, resulting in increased or prolonged opioid effects. These effects could be more pronounced with concomitant use of HYSINGLA ER and CYP3A4 inhibitors, particularly when an inhibitor is added after a stable dose of HYSINGLA ER is achieved [see Warnings and Precautions (5.5)]. After stopping a CYP3A4 inhibitor, as the effects of the inhibitor decline, the hydrocodone plasma concentration will decrease [see Clinical Pharmacology (12.3)], resulting in decreased opioid efficacy or a withdrawal syndrome in patients who had developed physical dependence to hydrocodone. Intervention: If concomitant use is necessary, consider dosage reduction of HYSINGLA ER until stable drug effects are achieved. Monitor patients for respiratory depression and sedation at frequent intervals. If a CYP3A4 inhibitor is discontinued, consider increasing the HYSINGLA ER dosage until stable drug effects are achieved. Monitor for signs of opioid withdrawal. Clinical Impact: The concomitant use of HYSINGLA ER and CYP3A4 inducers can decrease the plasma concentration of hydrocodone [see Clinical Pharmacology (12.3)], resulting in decreased efficacy or onset of a withdrawal syndrome in patients who have developed physical dependence to hydrocodone [see Warnings and Precautions (5.5)]. After stopping a CYP3A4 inducer, as the effects of the inducer decline, the hydrocodone plasma concentration will increase [see Clinical Pharmacology (12.3)], which could increase or prolong both the therapeutic effects and adverse reactions, and may cause serious respiratory depression. Intervention: If concomitant use is necessary, consider increasing the HYSINGLA ER dosage until stable drug effects are achieved. Monitor for signs of opioid withdrawal. If a CYP3A4 inducer is discontinued, consider HYSINGLA ER dosage reduction and monitor for signs of respiratory depression. Intervention: If concomitant use is warranted, carefully observe the patient, particularly during treatment initiation and dose adjustment. Discontinue HYSINGLA ER if serotonin syndrome is suspected. Intervention: The use of HYSINGLA ER is not recommended for patients taking MAOIs or within 14 days of stopping such treatment. Clinical Impact: May reduce the analgesic effect of HYSINGLA ER and/or precipitate withdrawal symptoms. Clinical Impact: Hydrocodone may enhance the neuromuscular blocking action of skeletal muscle relaxants and produce an increased degree of respiratory depression. Intervention: Monitor patients for signs of respiratory depression that may be greater than otherwise expected and decrease the dosage of HYSINGLA ER and/or the muscle relaxant as necessary. Intervention: Monitor patients for signs of urinary retention or reduced gastric motility when HYSINGLA ER is used concomitantly with anticholinergic drugs. Clinical Impact: Concomitant use of HYSINGLA ER with strong laxatives that rapidly increase gastrointestinal motility, may decrease hydrocodone absorption and result in decreased hydrocodone plasma levels. Intervention: If HYSINGLA ER is used in these patients, closely monitor for the development of adverse events as well as changing analgesic requirements. Prolonged use of opioid analgesics during pregnancy may cause neonatal opioid withdrawal syndrome [see Warnings and Precautions (5.4)]. Available data with HYSINGLA ER in pregnant women are insufficient to inform a drug-associated risk for major birth defects and miscarriage. In animal reproduction studies with hydrocodone in rats and rabbits no embryotoxicity or teratogenicity was observed. However, reduced pup survival rates, reduced fetal/pup body weights, and delayed ossification were observed at doses causing maternal toxicity. In all of the studies conducted, the exposures in animals were less than the human exposure [see Data]. Opioids cross the placenta and may produce respiratory depression and psycho-physiologic effects in neonates. An opioid antagonist, such as naloxone, must be available for reversal of opioid-induced respiratory depression in the neonate. HYSINGLA ER is not recommended for use in pregnant women during or immediately prior to labor, when use of shorter-acting analgesics or other analgesic techniques are more appropriate. Opioid analgesics, including HYSINGLA ER, can prolong labor through actions which temporarily reduce the strength, duration, and frequency of uterine contractions. However, this effect is not consistent and may be offset by an increased rate of cervical dilation, which tends to shorten labor. Monitor neonates exposed to opioid analgesics during labor for signs of excess sedation and respiratory depression. No evidence of embryotoxicity or teratogenicity was observed after oral administration of hydrocodone throughout the period of organogenesis in rats and rabbits at doses up to 30 mg/kg/day (approximately 0.1 and 0.3 times, respectively, the human hydrocodone dose of 120 mg/day based on AUC exposure comparisons). However, in these studies, reduced fetal body weights and delayed ossification were observed in rat at 30 mg/kg/day and reduced fetal body weights were observed in in rabbit at 30 mg/kg/day (approximately 0.1 and 0.3 times, respectively, the human hydrocodone dose of 120 mg/day based on AUC exposure comparisons). In a pre- and post-natal development study pregnant rats were administered oral hydrocodone throughout the period of gestation and lactation. At a dose of 30 mg/kg/day decreased pup viability, pup survival indices, litter size and pup body weight were observed. This dose is approximately 0.1 times the human hydrocodone dose of 120 mg/day based on AUC exposure comparisons. Hydrocodone is present in human milk. A published lactation study reports variable concentrations of hydrocodone and hydromorphone (an active metabolite) in breast milk with administration of immediate-release hydrocodone to nursing mothers in the early post-partum period. This lactation study did not assess breastfed infants for potential adverse drug reactions. Lactation studies have not been conducted with HYSINGLA, and no information is available on the effects of the drug on the breastfed infant or the effects of the drug on milk production. Because of the potential for serious adverse reactions, including excess sedation and respiratory depression in a breastfed infant, advise patients that breastfeeding is not recommended during treatment with HYSINGLA ER. Monitor infants exposed to HYSINGLA ER through breast milk for excess sedation and respiratory depression. Withdrawal symptoms can occur in breastfed infants when maternal administration of an opioid analgesic is stopped, or when breastfeeding is stopped. The safety and effectiveness of HYSINGLA ER in pediatric patients have not been established. In a controlled pharmacokinetic study, elderly subjects (greater than 65 years) compared to young adults had similar plasma concentrations of hydrocodone [see Clinical Pharmacology (12.3)]. Of the 1827 subjects exposed to HYSINGLA ER in the pooled chronic pain studies, 241 (13%) were age 65 and older (including those age 75 and older), while 42 (2%) were age 75 and older. In clinical trials with appropriate initiation of therapy and dose titration, no untoward or unexpected adverse reactions were seen in the elderly patients who received HYSINGLA ER. In general, use caution when selecting a dosage for an elderly patient, usually starting at the low end of the dosing range, reflecting the greater frequency of decreased hepatic, renal, or cardiac function and of concomitant disease or other drug therapy. Respiratory depression is the chief risk for elderly patients treated with opioids, and has occurred after large initial doses were administered to patients who were not opioid-tolerant or when opioids were co-administered with other agents that depress respiration. Titrate the dosage of HYSINGLA ER slowly in geriatric patients and monitor closely for signs of central nervous system and respiratory depression [see Warnings and Precautions (5.3)]. Hydrocodone is known to be substantially excreted by the kidney, and the risk of adverse reactions to this drug may be greater in patients with impaired renal function. Because elderly patients are more likely to have decreased renal function, care should be taken in dose selection, and it may be useful to monitor renal function. No adjustment in starting dose with HYSINGLA ER is required in patients with mild or moderate hepatic impairment. Patients with severe hepatic impairment may have higher plasma concentrations than those with normal hepatic function [see Clinical Pharmacology (12.3)]. Therefore, a dosage reduction is recommended for these patients [see Dosage and Administration (2.4)]. Monitor closely for respiratory depression, sedation, and hypotension. No dose adjustment is needed in patients with mild renal impairment. Patients with moderate or severe renal impairment or end stage renal disease have higher plasma concentrations than those with normal renal function [see Clinical Pharmacology (12.3)]. Therefore, a dosage reduction is recommended for these patients [see Dosage and Administration (2.5)]. Monitor closely for respiratory depression, sedation, and hypotension. HYSINGLA ER contains hydrocodone bitartrate, a Schedule II controlled substance. HYSINGLA ER contains hydrocodone, a substance with a high potential for abuse similar to other opioids, including fentanyl, hydromorphone, methadone, morphine, oxycodone, oxymorphone, and tapentadol. HYSINGLA ER can be abused and is subject to misuse, addiction, and criminal diversion [see Warnings and Precautions (5.1)]. The high drug content in the extended-release formulation adds to the risk of adverse outcomes from abuse and misuse. All patients treated with opioids require careful monitoring for signs of abuse and addiction because use of opioid analgesic products carries the risk of addiction even under appropriate medical use. "Drug-seeking" behavior is very common in persons with substance use disorders. Drug seeking tactics include emergency calls or visits near the end of office hours, refusal to undergo appropriate examination, testing, or referral, repeated “loss” of prescriptions, tampering with prescriptions, and reluctance to provide prior medical records or contact information for other treating healthcare provider(s). “Doctor shopping” (visiting multiple prescribers to obtain additional prescriptions) is common among drug abusers and people with untreated addiction. Preoccupation with achieving adequate pain relief can be appropriate behavior in a patient with poor pain control. HYSINGLA ER, like other opioids, can be diverted for non-medical use into illicit channels of distribution. Careful record-keeping of prescribing information, including quantity, frequency, and renewal requests, as required by state and federal law, is strongly advised. HYSINGLA ER is for oral use only. Abuse of HYSINGLA ER poses a risk of overdose and death. Abuse may occur by taking intact tablets in quantities greater than prescribed or without legitimate purpose, by crushing and chewing or snorting the crushed formulation, or by injecting a solution made from the crushed formulation. The risk is increased with concurrent use of HYSINGLA ER with alcohol or other central nervous system depressants. Taking cut, broken, chewed, crushed, or dissolved HYSINGLA ER increases the risk of overdose and death. With parenteral abuse, the inactive ingredients in HYSINGLA ER can result in local tissue necrosis, infection, pulmonary granulomas, increased risk of endocarditis and valvular heart injury, embolism, and death. Parenteral drug abuse is commonly associated with transmission of infectious diseases, such as hepatitis and HIV. HYSINGLA ER is formulated with physicochemical properties intended to make the tablet more difficult to manipulate for misuse and abuse, and maintains some extended release characteristics even if the tablet is physically compromised. To evaluate the ability of these physicochemical properties to reduce the potential for abuse of HYSINGLA ER, a series of in vitro laboratory studies, pharmacokinetic studies and clinical abuse potential studies was conducted. A summary is provided at the end of this section. In vitro physical and chemical tablet manipulation studies were performed to evaluate the success of different extraction methods in defeating the extended-release formulation. Results support that HYSINGLA ER resists crushing, breaking, and dissolution using a variety of tools and solvents and retains some extended-release properties despite manipulation. When subjected to an aqueous environment, HYSINGLA ER gradually forms a viscous hydrogel (i.e., a gelatinous mass) that resists passage through a hypodermic needle. Two randomized, double-blind, placebo and active-comparator studies in non-dependent opioid abusers were conducted to characterize the abuse potential of HYSINGLA ER following physical manipulation and administration via the intranasal and oral routes. For both studies, drug liking was measured on a bipolar drug liking scale of 0 to 100 where 50 represents a neutral response of neither liking nor disliking, 0 represents maximum disliking, and 100 represents maximum liking. Response to whether the subject would take the study drug again was measured on a unipolar scale of 0 to 100 where 0 represents the strongest negative response (“definitely would not take drug again”) and 100 represents the strongest positive response (“definitely would take drug again”). In the intranasal abuse potential study, 31 subjects were dosed and 25 subjects completed the study. Treatments studied included intranasally administered tampered HYSINGLA ER 60 mg tablets, powdered hydrocodone bitartrate 60 mg, and placebo. Incomplete dosing due to granules falling from the subjects’ nostrils occurred in 82% (n = 23) of subjects receiving tampered HYSINGLA ER compared to no subjects with powdered hydrocodone or placebo. The intranasal administration of tampered HYSINGLA ER was associated with statistically significantly lower mean and median scores for drug liking and take drug again (P<0.001 for both), compared with powdered hydrocodone as summarized in Table 4. Figure 1 demonstrates a comparison of peak drug liking scores for tampered HYSINGLA ER compared with powdered hydrocodone in subjects (n = 25) who received both treatments intranasally. 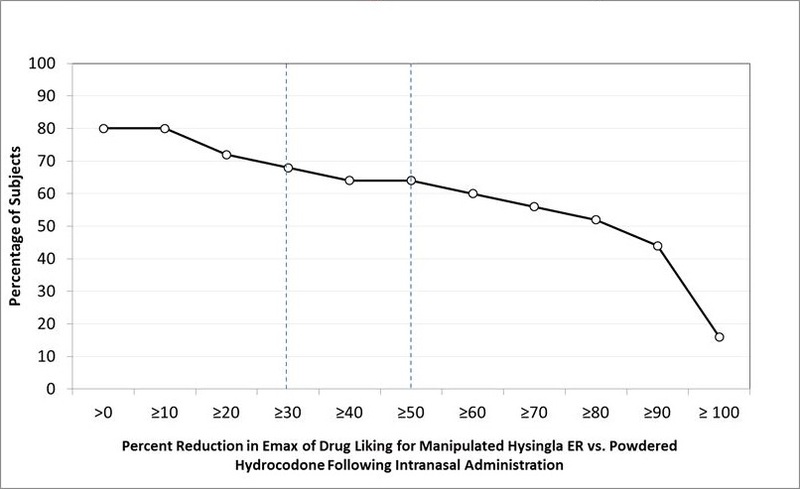 The Y-axis represents the percent of subjects attaining a percent reduction in peak drug liking scores for tampered HYSINGLA ER vs. hydrocodone powder greater than or equal to the value on the X-axis. Approximately 80% (n = 20) of subjects had some reduction in drug liking with tampered HYSINGLA ER relative to hydrocodone powder. Sixty-eight percent (n = 17) of subjects had a reduction of at least 30% in drug liking with tampered HYSINGLA ER compared with hydrocodone powder, and approximately 64% (n = 16) of subjects had a reduction of at least 50% in drug liking with tampered HYSINGLA ER compared with hydrocodone powder. Approximately 20% (n = 5) of subjects had no reduction in liking with tampered HYSINGLA ER relative to hydrocodone powder. In the oral abuse potential study, 40 subjects were dosed and 35 subjects completed the study. Treatments studied included oral administrations of chewed HYSINGLA ER 60 mg tablets, intact HYSINGLA ER 60 mg tablets, 60 mg aqueous hydrocodone bitartrate solution, and placebo. The oral administration of chewed and intact HYSINGLA ER was associated with statistically lower mean and median scores on scales that measure drug liking and desire to take drug again (P<0.001), compared to hydrocodone solution as summarized in Table 5. 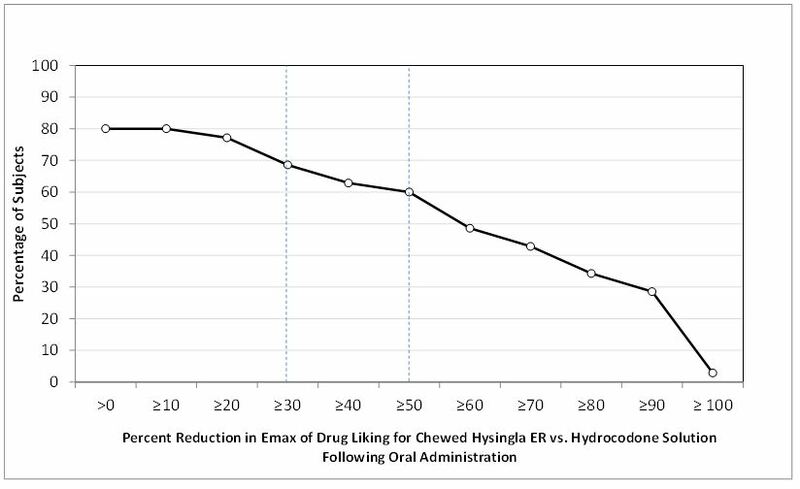 Figure 2 demonstrates a comparison of peak drug liking scores for chewed HYSINGLA ER compared with hydrocodone solution in subjects who received both treatments orally. 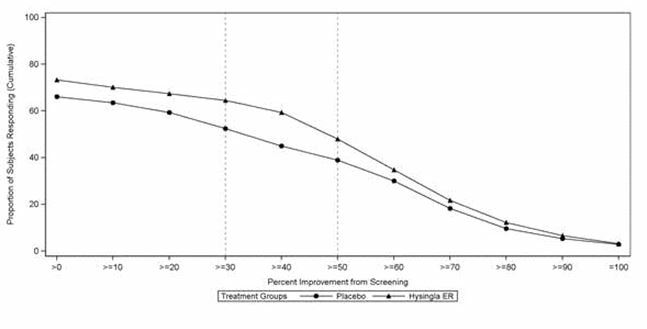 The Y-axis represents the percent of subjects attaining a percent reduction in peak drug liking scores for chewed HYSINGLA ER vs. hydrocodone solution greater than or equal to the value on the X-axis. Approximately 80% (n = 28) of subjects had some reduction in drug liking with chewed HYSINGLA ER relative to hydrocodone solution. Approximately 69% (n = 24) of subjects had a reduction of at least 30% in drug liking with chewed HYSINGLA ER compared with hydrocodone solution, and approximately 60% (n = 21) of subjects had a reduction of at least 50% in drug liking with chewed HYSINGLA ER compared with hydrocodone solution. Approximately 20% (n = 7) of subjects had no reduction in drug liking with chewed HYSINGLA ER relative to hydrocodone solution. The results of a similar analysis of drug liking for intact HYSINGLA ER relative to hydrocodone solution were comparable to the results of chewed HYSINGLA ER relative to hydrocodone solution. Approximately 83% (n = 29) of subjects had some reduction in drug liking with intact HYSINGLA ER relative to hydrocodone solution. Eighty-three percent (n = 29) of subjects had a reduction of at least 30% in peak drug liking scores with intact HYSINGLA ER compared to hydrocodone solution, and approximately 74% (n = 26) of subjects had a reduction of at least 50% in peak drug liking scores with intact HYSINGLA ER compared with hydrocodone solution. Approximately 17% (n = 6) had no reduction in drug liking with intact HYSINGLA ER relative to hydrocodone solution. The in vitro data demonstrate that HYSINGLA ER has physical and chemical properties that are expected to deter intranasal and intravenous abuse. The data from the clinical abuse potential studies, along with support from the in vitro data, also indicate that HYSINGLA ER has physicochemical properties that are expected to reduce intranasal abuse and oral abuse when chewed. However, abuse of HYSINGLA ER by the intravenous, intranasal, and oral routes is still possible. Additional data, including epidemiological data, when available, may provide further information on the impact of HYSINGLA ER on the abuse liability of the drug. Accordingly, this section may be updated in the future as appropriate. HYSINGLA ER should not be abruptly discontinued [see Dosage and Administration (2.6)]. If HYSINGLA ER is abruptly discontinued in a physically dependent patient, a withdrawal syndrome may occur. Some or all of the following can characterize this syndrome: restlessness, lacrimation, rhinorrhea, yawning, perspiration, chills, myalgia, and mydriasis. Other signs and symptoms also may develop, including irritability, anxiety, backache, joint pain, weakness, abdominal cramps, insomnia, nausea, anorexia, vomiting, diarrhea, increased blood pressure, respiratory rate, or heart rate. Acute overdosage with HYSINGLA ER can be manifested by respiratory depression, somnolence progressing to stupor or coma, skeletal muscle flaccidity, cold and clammy skin, constricted pupils, and, in some cases, pulmonary edema, bradycardia, hypotension, partial or complete airway obstruction, atypical snoring, and death. Marked mydriasis rather than miosis may be seen with hypoxia in overdose situations [see Clinical Pharmacology (12.2)]. In case of overdose, priorities are the re-establishment of a patent airway and institution of assisted or controlled ventilation, if needed. Employ other supportive measures (including oxygen and vasopressors) in the management of circulatory shock and pulmonary edema accompanying overdose as indicated. Cardiac arrest or arrhythmias will require advanced life support techniques. The opioid antagonists, naloxone or nalmefene, are specific antidotes to respiratory depression resulting from opioid overdosage. For clinically significant respiratory or circulatory depression secondary to hydrocodone overdose, administer an opioid antagonist. Opioid antagonists should not be administered in the absence of clinically significant respiratory or circulatory depression secondary to hydrocodone overdose. Because the duration of opioid reversal is expected to be less than the duration of action of hydrocodone in HYSINGLA ER, carefully monitor the patient until spontaneous respiration is reliably reestablished. HYSINGLA ER will continue to release hydrocodone and add to the hydrocodone load for 24 to 48 hours or longer following ingestion, necessitating prolonged monitoring. If the response to an opioid antagonist is suboptimal or only brief in nature, administer additional antagonist as directed by the product’s prescribing information. In an individual physically dependent on opioids, administration of the recommended dose of the antagonist will precipitate an acute withdrawal syndrome. The severity of the withdrawal syndrome produced will depend on the degree of physical dependence and the dose of the antagonist administered. If a decision is made to treat serious respiratory depression in the physically dependent patient, administration of the antagonist should be initiated with care and by titration with smaller than usual doses of the antagonist. HYSINGLA ER (hydrocodone bitartrate) extended-release tablets are supplied in 20 mg, 30 mg, 40 mg, 60 mg, 80 mg, 100 mg and 120 mg film-coated tablets for oral administration. The tablet strengths describe the amount of hydrocodone per tablet as the bitartrate salt. Empirical formula: C18H21NO3 C4H6O6 2½H2O; Molecular weight: 494.49. Hydrocodone bitartrate exists as fine white crystals or a crystalline powder. It is affected by light. It is soluble in water, slightly soluble in alcohol, and insoluble in ether and chloroform. The 20 mg, 30 mg, 40 mg, 60 mg, 80 mg, 100 mg and 120 mg tablets contain the following inactive ingredients: Butylated Hydroxytoluene (BHT, an additive in Polyethylene Oxide), Hydroxypropyl Cellulose, Macrogol/PEG 3350, Magnesium Stearate, Microcrystalline Cellulose, Polyethylene Oxide, Polysorbate 80, Polyvinyl Alcohol, Talc, Titanium Dioxide, and Black Ink. The 20 mg tablets also contain Iron Oxide Yellow and FD&C Blue #2 Aluminum Lake/Indigo Carmine Aluminum Lake. The 30 mg tablets also contain Iron Oxide Yellow. The 40 mg tablets also contain Iron Oxide Yellow, Iron Oxide Red, and Iron Oxide Black. The 60 mg tablets also contain Iron Oxide Yellow and Iron Oxide Red. The 80 mg tablets also contain Iron Oxide Red. The 100 mg tablets also contain FD&C Blue #2 Aluminum Lake. Black Ink Contains: Shellac Glaze (in Ethanol), Isopropyl Alcohol, Iron Oxide Black, N-Butyl Alcohol, Propylene Glycol and Ammonium Hydroxide. QTc interval prolongation was studied in a double-blind, placebo- and positive-controlled 3-treatment parallel-group, dose-escalating study of HYSINGLA ER in 196 healthy subjects. QTc interval prolongation was observed following HYSINGLA ER 160 mg per day. The maximum mean (90% upper confidence bound) difference in the QTc interval between HYSINGLA ER and placebo (after baseline-correction) at steady state was 6 (9) milliseconds, 7 (10) milliseconds, and 10 (13) milliseconds at HYSINGLA ER doses of 80 mg, 120 mg and 160mg respectively. For clinical implications of the prolonged QTc interval, see Warnings and Precautions (5.10). Hydrocodone produces respiratory depression by direct action on brainstem respiratory centers. The respiratory depression involves a reduction in the responsiveness of the brain stem respiratory centers to both increases in carbon dioxide tension and electrical stimulation. Hydrocodone causes miosis, even in total darkness. Pinpoint pupils are a sign of opioid overdose but are not pathognomonic (e.g., pontine lesions of hemorrhagic or ischemic origin may produce similar findings). Marked mydriasis rather than miosis may be seen with hypoxia in overdose situations [see Overdosage (10)]. Hydrocodone causes a reduction in motility associated with an increase in smooth muscle tone in the antrum of the stomach and duodenum. Digestion of food in the small intestine is delayed and propulsive contractions are decreased. Propulsive peristaltic waves in the colon are decreased, while tone is increased to the point of spasm, resulting in constipation. Other opioid-induced effects may include a reduction in biliary and pancreatic secretions, spasm of sphincter of Oddi, and transient elevations in serum amylase. Hydrocodone produces peripheral vasodilation, which may result in orthostatic hypotension or syncope Manifestations of histamine release and/or peripheral vasodilation may include pruritus, flushing, red eyes, sweating, and/or orthostatic hypotension. The minimum effective analgesic concentration will vary widely among patients who have been previously treated with potent agonist opioids. The minimum effective analgesic concentration of hydrocodone for any individual patient may increase over time due to an increase in pain, the development of a new pain syndrome, and/or the development of analgesic tolerance [see Dosage and Administration (2.1, 2.3)]. There is a relationship between increasing hydrocodone plasma concentration and increasing frequency of adverse reactions such as nausea, vomiting, CNS effects, and respiratory depression. In opioid-tolerant patients, the situation may be altered by the development of tolerance to opioid-related adverse reactions [see Dosage and Administration (2.1, 2.2, 2.3)]. HYSINGLA ER is a single-entity extended-release formulation of hydrocodone that yields a gradual increase in plasma hydrocodone concentrations with a median Tmax of 14 – 16 hours noted for different dose strengths. Peak plasma levels may occur in the range of 6 -30 hours after single dose HYSINGLA ER administration. Systemic exposure (AUC and Cmax) increased linearly with doses from 20 to 120 mg. Both Cmax and AUC increased slightly more than dose proportionally (Table 6). The mean terminal half-life (t1/2) was similar for all HYSINGLA ER dose strengths ranging from 7 to 9 hours. As compared to an immediate-release hydrocodone combination product, HYSINGLA ER at the same daily dose results in similar bioavailability but with lower maximum concentrations at steady state (Figure 3). Steady-state plasma hydrocodone concentrations were confirmed on day 3 of once-daily dosing of HYSINGLA ER. The extent of accumulation of systemic exposure was 1.3 and 1.1 fold with respect to AUC and Cmax at steady-state. The mean terminal half-life (t1/2) at steady state was 7 hours. Median Tmax values were 14 hours (range: 12 to 24 hours) on both Day 1 and Day 5 following once daily administration of HYSINGLA ER for five days. Daily fluctuation in peak to trough plasma levels of hydrocodone were higher at 80 mg and 120 mg doses of HYSINGLA ER compared to 30 mg dose (Table 7). * Mean (minimum, maximum); Percentage fluctuation in plasma concentration is derived as (Cmax,ss – Cmin, ss)*100/Cavg,ss. Cmax and AUC of HYSINGLA ER 120 mg tablets were similar under low fat conditions relative to fasting conditions (17% and 9% higher, respectively). Cmax was higher (54%) under high fat conditions relative to fasting conditions; however, AUC of HYSINGLA ER 120 mg tablets was only 20% higher when co-administered with a high fat meal. HYSINGLA ER may be administered without regard to meals. Following administration of HYSINGLA ER, the typical (70 kg adult) value of apparent volume of distribution (V/F) is 402 L, suggesting extensive tissue distribution. The extent of in vivo binding of hydrocodone to human plasma proteins was minimal with a mean % bound at 36%. Hydrocodone exhibits a complex pattern of metabolism, including N-demethylation, O-demethylation, and 6-keto reduction to the corresponding 6-α-and 6-β-hydroxy metabolites. CYP3A4 mediated N-demethylation to inactive norhydrocodone is the primary metabolic pathway of hydrocodone with a lower contribution from CYP2B6 and CYP2C19. The minor metabolite hydromorphone (<3% of the circulating parent hydrocodone) was mainly formed by CYP2D6 mediated O-demethylation with a smaller contribution by CYP2B6 and CYP2C19. Hydromorphone may contribute to the total analgesic effect of hydrocodone. Hydrocodone and its metabolites are cleared primarily by renal excretion. The percent of administered dose excreted unchanged as hydrocodone in urine was 6.5% in subjects with normal renal function, and 5.0%, 4.8%, and 2.3% in subjects with mild, moderate, and severe renal impairment, respectively. Renal clearance (CLr) of hydrocodone in healthy subjects was small (5.3 L/h) compared to apparent oral clearance (CL/F, 83 L/h); suggesting that non-renal clearance is the main elimination route. Ninety-nine percent of the administered dose is eliminated within 72 hours. The mean terminal half-life (t1/2) was similar for all HYSINGLA ER dose strengths ranging from approximately 7 to 9 hours across the range of doses. Following administration of 40 mg HYSINGLA ER, the pharmacokinetics of hydrocodone in healthy elderly subjects (65 to 77 years) are similar to the pharmacokinetics in healthy younger subjects (20 to 45 years). There were no clinically meaningful increase in Cmax (16%) and AUC (15%) of hydrocodone in elderly as compared with younger adult subjects [see Use in Specific Populations (8.5)]. Systemic exposure of hydrocodone (Cmax and AUC) was similar between males and females. After a single dose of 20 mg HYSINGLA ER in subjects (8 each) with normal hepatic function, mild, moderate or severe hepatic impairment based on Child-Pugh classifications, mean hydrocodone Cmax values were 16, 15, 17, and 18 ng/mL, respectively. Mean hydrocodone AUC values were 342, 310, 390, and 415 ng.hr/mL for subjects with normal hepatic function, mild, moderate or severe hepatic impairment, respectively. Geometric mean hydrocodone Cmax values were -6%, 5%, and 5% and AUC values were -14%, 13%, and 4% in patients with mild, moderate or severe hepatic impairment, respectively, when compared with subjects with normal hepatic function. The mean in vivo plasma protein binding of hydrocodone across the groups was similar, ranging from 33% to 37% [see Use in Specific Populations (8.6)]. After a single dose of 60 mg HYSINGLA ER in subjects (8 each) with normal renal function, mild, moderate, or severe renal impairment based on Cockcroft-Gault criteria and end stage renal disease (with dialysis) patients, mean hydrocodone Cmax values were 40, 50, 51, 46, and 38 ng/mL, respectively. Mean hydrocodone AUC values were 754, 942, 1222, 1220, and 932 ng.hr/mL for subjects with normal renal function, mild, moderate or severe renal impairment and ESRD with dialysis, respectively. Hydrocodone Cmax values were 14%, 23%, 11% and -13% and AUC values were 13%, 61%, 57% and 4% higher in patients with mild, moderate or severe renal impairment or end stage renal disease with dialysis, respectively [see Use in Specific Populations (8.7)]. Co-administration of HYSINGLA ER (20 mg single dose) and CYP3A4 inhibitor ketoconazole (200 mg BID for 6 days) increased mean hydrocodone AUC and Cmax by 135% and 78%, respectively [see Warnings and Precautions (5.5) and Drug Interactions (7)]. The 90% confidence interval (CI) of the geometric means for hydrocodone AUCinf (98 to 115%), AUCt (98 to 115%), and Cmax (93 to 121%) values were within the range of 80 to 125% when a single dose of HYSINGLA ER 20 mg was co-administered with CYP2D6 inhibitor paroxetine (20 mg treatment each morning for 12 days). No differences in systemic exposure of hydrocodone were observed in the presence of paroxetine. Hydrocodone was evaluated for carcinogenic potential in rats and mice. In a two-year bioassay in rats, doses up to 25 mg/kg in males and females were administered orally and no treatment-related neoplasms were observed (exposure is equivalent to 0.2 times the human hydrocodone dose of 120 mg/day based on AUC exposure comparisons). In a two-year bioassay in mice, doses up to 200 mg/kg in males and 100 mg/kg in females were administered orally and no treatment-related neoplasms were observed (exposure is equivalent to 3.5 times and 3.0 times, respectively, the human hydrocodone dose of 120 mg/day based on AUC exposure comparisons). Hydrocodone was genotoxic in the mouse lymphoma assay in the presence of rat S9 metabolic activation but not in the absence of rat metabolic activation. However, hydrocodone was not genotoxic in the mouse lymphoma assay with or without human S9 metabolic activation. There was no evidence of genotoxic potential with hydrocodone in an in vitro bacterial reverse mutation assay with Salmonella typhimurium and Escherichia coli with or without metabolic activation or in an in vivo mouse bone marrow micronucleus test with or without metabolic activation. No effect on fertility or general reproductive performance was seen with oral administration of hydrocodone to male and female rats at doses up to 25 mg/kg/day (approximately 0.06 times and 0.08 times, respectively, the human hydrocodone dose of 120 mg/day based on AUC exposure comparisons). The efficacy and safety of HYSINGLA ER was evaluated in a randomized double-blind, placebo-controlled, multi-center, 12-week clinical trial in both opioid-experienced and opioid-naïve patients with moderate to severe chronic low back pain. A total of 905 chronic low back pain patients (opioid naive and opioid-experienced) who were not responsive to their prior analgesic therapy entered an open-label conversion and dose- titration period for up to 45 days with HYSINGLA ER. Patients were dosed once daily with HYSINGLA ER (20 to 120 mg). Patients stopped their prior opioid analgesics and/or nonopioid analgesics prior to starting HYSINGLA ER treatment. Optional use of rescue medication (immediate-release oxycodone 5 mg) up to 2 doses (2 tablets) was permitted during the dose titration period. For inadequately controlled pain, HYSINGLA ER dose was allowed to be increased once every 3–5 days until a stabilized and tolerable dose was identified. During the dose-titration period, 65% of the patients achieved a stable HYSINGLA ER dose and entered the double-blind treatment period. The remaining subjects discontinued from the dose-titration period for the following reasons: adverse events (10%); lack of therapeutic effect (5%); confirmed or suspected diversion (3%); subject’s choice (5%); lost to follow-up (2%); administrative reasons (2%); and failure to achieve protocol-defined reduction in pain score (7%). Following the dose titration period, 588 patients (65%) were randomized at a ratio of 1:1 into a 12-week double-blind treatment period with their fixed stabilized dose of HYSINGLA ER (or matching placebo). These patients met the study randomization criteria of adequate analgesia (pain reduction of at least 2 points to a score of 4 or less on a 0-10 numerical rating scale) and acceptable tolerability of HYSINGLA ER. Patients randomized to placebo were given a blinded taper of HYSINGLA ER according to a pre-specified tapering schedule, 3 days on each step-down dose (reduced by 25-50% from the previous dose). Patients were allowed to use rescue medication (immediate-release oxycodone 5 mg) up to 6 doses (6 tablets) per day depending on their randomized HYSINGLA ER dose. During the double-blind period, 229 treated patients (77%) completed the 12-week treatment with HYSINGLA ER and 210 patients (72%) completed on placebo. Overall, 10% of patients discontinued due to lack of therapeutic effect (5% in HYSINGLA patients and 15% in placebo patients); 5% of patients discontinued due to adverse events (6% in HYSINGLA ER treated patients and 3% in placebo patients). HYSINGLA ER provided greater analgesia compared with placebo. There was a statistically significant difference in the weekly average pain scores at Week 12 between the two groups. The percentage of patients (responders) in each group who demonstrated improvement in their weekly average pain scores at Week 12, as compared with screening is shown in Figure 4. The figure is cumulative, so that patients whose change from screening is, for example, 30%, are also included at every level of improvement below 30%. Patients who did not complete the study were classified as non-responders. Treatment with HYSINGLA ER resulted in a higher proportion of responders, defined as patients with at least a 30% and 50% improvement, as compared with placebo. HYSINGLA ER (hydrocodone bitartrate) extended-release tablets 20 mg are round, green-colored, bi-convex tablets printed with “HYD 20” and are supplied in child-resistant closure, opaque plastic bottles of 60 (NDC 59011-271-60). HYSINGLA ER (hydrocodone bitartrate) extended-release tablets 30 mg are round, yellow-colored, bi-convex tablets printed with “HYD 30” and are supplied in child-resistant closure, opaque plastic bottles of 60 (NDC 59011-272-60). HYSINGLA ER (hydrocodone bitartrate) extended-release tablets 40 mg are round, grey-colored, bi-convex tablets printed with “HYD 40” and are supplied in child-resistant closure, opaque plastic bottles of 60 (NDC 59011-273-60). HYSINGLA ER (hydrocodone bitartrate) extended-release tablets 60 mg are round, beige-colored, bi-convex tablets printed with “HYD 60” and are supplied in child-resistant closure, opaque plastic bottles of 60 (NDC 59011-274-60). HYSINGLA ER (hydrocodone bitartrate) extended-release tablets 80 mg are round, pink-colored, bi-convex tablets printed with “HYD 80” and are supplied in child-resistant closure, opaque plastic bottles of 60 (NDC 59011-275-60). HYSINGLA ER (hydrocodone bitartrate) extended-release tablets 100 mg are round, blue-colored, bi-convex tablets printed with “HYD 100” and are supplied in child-resistant closure, opaque plastic bottles of 60 (NDC 59011-276-60). HYSINGLA ER (hydrocodone bitartrate) extended-release tablets 120 mg are round, white-colored, bi-convex tablets printed with “HYD 120” and are supplied in child-resistant closure, opaque plastic bottles of 60 (NDC 59011-277-60). Dispense in tight, light-resistant container, as defined by the USP. Inform patients that the use of HYSINGLA ER, even when taken as recommended, can result in addiction, abuse, and misuse, which can lead to overdose or death [see Warnings and Precautions (5.1)]. Instruct patients not to share HYSINGLA ER with others and to take steps to protect HYSINGLA ER from theft or misuse. Inform patients of the risk of life-threatening respiratory depression, including information that the risk is greatest when starting HYSINGLA ER or when the dosage is increased, and that it can occur even at recommended dosages [see Warnings and Precautions (5.3)]. Advise patients how to recognize respiratory depression and to seek medical attention if breathing difficulties develop. Inform patients that accidental ingestion, especially by children, may result in respiratory depression or death [see Warnings and Precautions (5.3)]. Instruct patients to take steps to store HYSINGLA ER securely and to dispose of unused HYSINGLA ER by flushing the tablets down the toilet. Inform patients and caregivers that potentially fatal additive effects may occur if HYSINGLA ER is used with benzodiazepines or other CNS depressants, including alcohol, and not to use these concomitantly unless supervised by a health care provider [see Warnings and Precautions (5.6), Drug Interactions (7)]. Inform patients to avoid taking HYSINGLA ER while using any drugs that inhibit monoamine oxidase. Patients should not start MAOIs while taking HYSINGLA ER [see Drug Interactions (7)]. Use HYSINGLA ER exactly as prescribed to reduce the risk of life-threatening adverse reactions (e.g., respiratory depression) [see Warnings and Precautions (5.3)]. Swallow tablets whole, one tablet at a time, with enough water to ensure swallowing immediately after placing in the mouth [see Dosage and Administration (2.1)]. Do not chew, crush, or dissolve the tablets [see Dosage and Administration (2.1)]. Do not discontinue HYSINGLA ER without first discussing the need for a tapering regimen with the prescriber [see Dosage and Administration (2.6)]. Inform patients that HYSINGLA ER may cause orthostatic hypotension and syncope. Instruct patients how to recognize symptoms of low blood pressure and how to reduce the risk of serious consequences should hypotension occur (e.g., sit or lie down, carefully rise from a sitting or lying position) [see Warnings and Precautions (5.9)]. Inform patients that QT prolongation has been observed with HYSINGLA ER [see Clinical Pharmacology (12.2)]. HYSINGLA ER should be avoided in patients with congenital long QT syndrome. Instruct patients with a history of congestive heart failure or bradyarrhythmias, and patients at risk for electrolyte abnormalities or who are taking other medications known to prolong the QT interval, that periodic monitoring of electrocardiograms and electrolytes may be necessary during therapy with HYSINGLA ER [see Warnings and Precautions (5.10)]. Inform patients that anaphylaxis has been reported with ingredients contained in HYSINGLA ER. Advise patients how to recognize such a reaction and when to seek medical attention [see Contraindication (4), Adverse Reactions (6)]. Inform female patients of reproductive potential that prolonged use of HYSINGLA ER during pregnancy can result in neonatal opioid withdrawal syndrome, which may be life-threatening if not recognized and treated [see Warnings and Precautions (5.4), Use in Specific Populations (8.1)]. Inform female patients of reproductive potential that HYSINGLA ER can cause fetal harm and to inform their healthcare provider of a known or suspected pregnancy [see Use in Specific Populations (8.1)]. Inform patients that chronic use of opioids may cause reduced fertility. It is not known whether these effects on fertility are reversible [see Adverse Reactions (6.2) Use in Specific Populations (8.3)]. Inform patients that HYSINGLA ER may impair the ability to perform potentially hazardous activities such as driving a car or operating heavy machinery. Blood levels of hydrocodone, in some patients, may be high at the end of 24 hours after repeated dose administration. Advise patients not to perform such tasks until they know how they will react to the medication [see Warnings and Precautions (5.16)]. Advise patients of the potential for severe constipation, including management instructions and when to seek medical attention. Instruct patients to monitor their analgesic response following the use of strong laxatives and to contact the prescriber if changes are noted [see Adverse Reactions (6), Clinical Pharmacology (12.2)]. Advise patients to dispose of any unused tablets from a prescription as soon as they are no longer needed by flushing down the toilet. Get emergency help right away if you take too much HYSINGLA ER (overdose). When you first start taking HYSINGLA ER, when your dose is changed, or if you take too much (overdose), serious or life-threatening breathing problems that can lead to death may occur. Taking HYSINGLA ER with other opioid medicines, benzodiazepines, alcohol, or other central nervous system depressants (including street drugs) can cause severe drowsiness, decreased awareness, breathing problems, coma, and death. Never give anyone else your HYSINGLA ER. They could die from taking it. Store HYSINGLA ER away from children and in a safe place to prevent stealing or abuse. Selling or giving away HYSINGLA ER is against the law. pregnant or planning to become pregnant. Prolonged use of HYSINGLA ER during pregnancy can cause withdrawal symptoms in your newborn baby that could be life-threatening if not recognized and treated. breastfeeding. Not recommended during treatment with HYSINGLA ER. It may harm your baby. taking prescription or over-the-counter medicines, vitamins, or herbal supplements. Taking HYSINGLA ER with certain other medicines can cause serious side effects and could lead to death. Do not change your dose. Take HYSINGLA ER exactly as prescribed by your healthcare provider. Use the lowest dose possible for the shortest time needed. Swallow HYSINGLA ER whole. Do not cut, break, chew, crush, dissolve, snort, or inject HYSINGLA ER because this may cause you to overdose and die. HYSINGLA ER should be taken 1 tablet at a time. Do not pre-soak, lick, or wet the tablet before placing it in your mouth to avoid choking on the tablet. Do not stop taking HYSINGLA ER without talking to your healthcare provider. After you stop taking HYSINGLA ER, flush any unused tablets down the toilet. Drive or operate heavy machinery until you know how HYSINGLA ER affects you. HYSINGLA ER can make you sleepy, dizzy, or lightheaded. Drink alcohol or use prescription or over-the-counter medicines that contain alcohol. Using products containing alcohol during treatment with HYSINGLA ER may cause you to overdose and die. These are not all the possible side effects of HYSINGLA ER. Call your doctor for medical advice about side effects. You may report side effects to FDA at 1-800-FDA-1088. For more information go to dailymed.nlm.nih.gov.